Tuscany has a charm and appeal all of it’s own. The slow and peaceful life. The vivid greens and fields of grapes used to make world-famous wines. The hilltop villages and tranquil surroundings. Tuscany is an escape from the real world. A haven of calm; in a world of restless activity. Italy’s answer to the Garden of Eden. On your journey through Tuscany, you can see this all for yourself and get a taste for what it means to us. 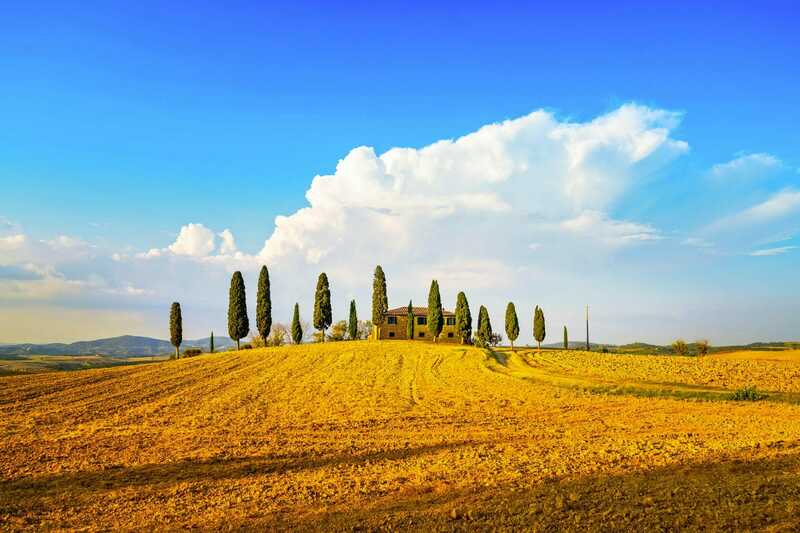 Tuscany has a landscape of greenery, rolling hills, vineyards, and winding paths. For miles all you can see is the famous landscape that inspired many artists, and particularly inspirational for Van Gogh. The land is farmed and used to make all sorts of wonderful produce, and it’s particularly famous for it’s wine. The Chianti area is very well known - as it’s the birthplace of some of the best wine in Italy! For all the wine lovers out there, Tuscany is the place to go. There is something so intriguing and exhilarating about a wine tasting tour in Italy, especially when it is amongst the rolling hills of Tuscany. Breathe in the flavours, the fruits, and the essences of the wine. Immerse yourself in the experience as the taste fills each and everyone one of your senses. Lose yourself in it. That’s what wine tasting in Tuscany is all about. Perched on top of the hills, there are many medieval towns and villages. Wander through the streets, marvelling at the history of the towns and the enchanting buildings that surround you everywhere, giving you just a glance into days gone by. Look down from viewpoints and see fields, trees and hills that go for miles in every direction. Tuscany is the truly one of the most enchanting, charming, and tranquil places that you could visit. You can experience everything mentioned and more, with our Private Chianti Wine and Hill Towns Trip. Escape the mundane of everyday life and see a whole new side to Italy. We have many other tours to Tuscany that you can browse through to find the one that is right for you. Whether you want a day tour from Rome, Brunello wine tour, or a day of culture experiencing the wine of Tuscany and Renaissance of Florence.